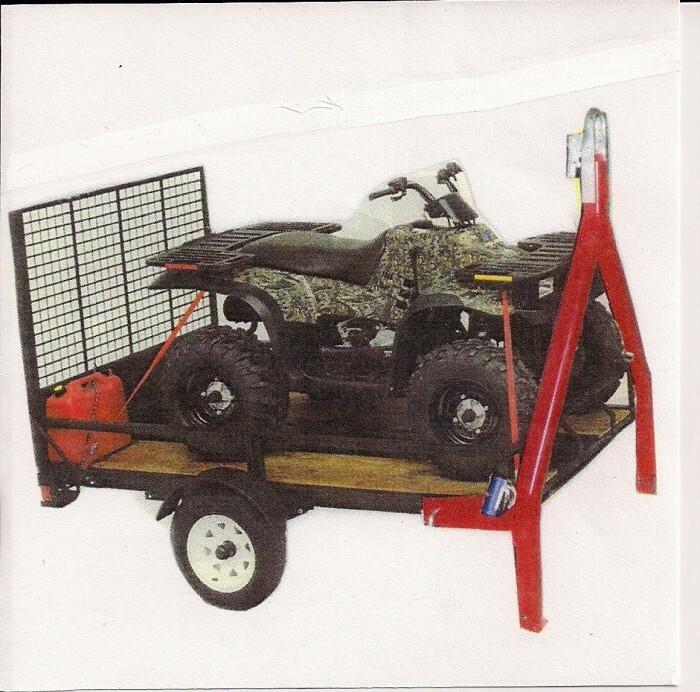 Fold-up, Lock-up security trailer for ATV's and many others. 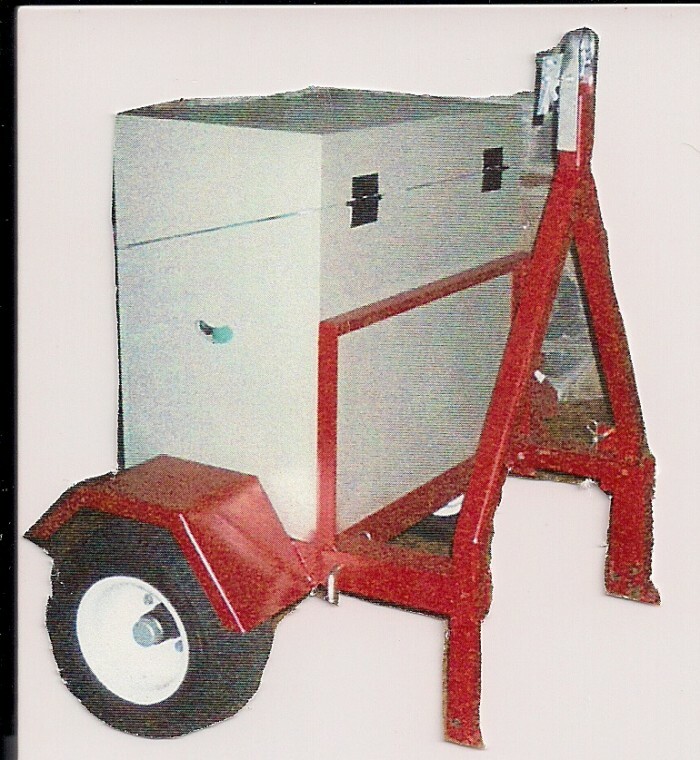 Purpose: the invention brings to utility trailers, quick and easy "fold-up" to save space and provide stability, plus "lock-up" features to protect valuable vehicles and equipment wherever they may be. (Especially when unattended). Function: The left side hitch-pin is removed allowing a "flip-down" leg to drop to the vertical position, giving ground support to the frame. 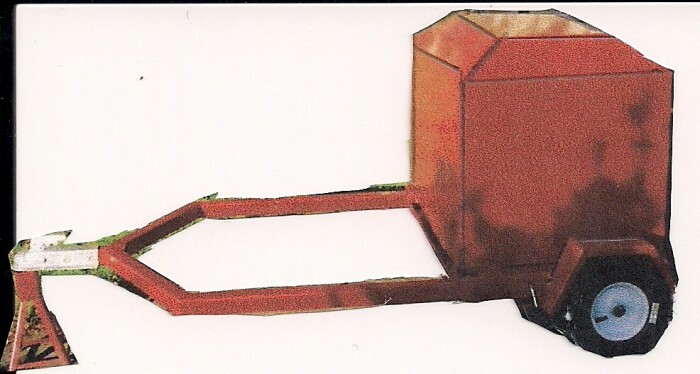 The "Y" shaped tongue lower portion, secured inside the frame is released by the same hitch pin, pivots on the frame to the vertical position, allowing the foot plate to contact the ground for support. The tongue may be locked in that position using aligned brackets and suitable locking device. (While the patent calls for two "flip-down" legs, a single one works very adequately). 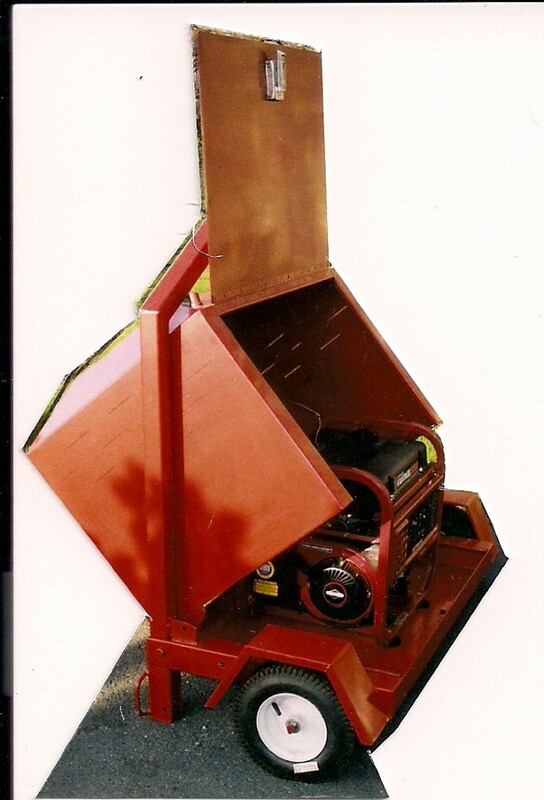 The Patent provides: a substantially Y-shaped tongue ( 18 ) pivots on a frame ( 2 ) into a perpendicular position where the lower portions of the side arms of the tongue ( 18 ) function as support legs for the frame ( 2 ), enabling the frame ( 2 ) to store and display materials or house equipment in the trailer bed. The tongue ( 18 ) is further secured vertically by hitch pins ( 8 ) in brackets ( 28 ) on the frame ( 2 ) that can be locked in place as a deterrent to theft. Two flip-down legs ( 30 ) pivotably mounted on the side of the frame ( 2 ) are used as temporary support legs before the lower portions of the side arms of the tongue ( 18 ) are fully engaged. The flip-down legs ( 30 ) are engaged when a hitch pin ( 8 ) is released from a hitch means on each side of the frame ( 2 ), enabling each flip-down leg ( 30 ) to freely pivot downward to contact the ground. 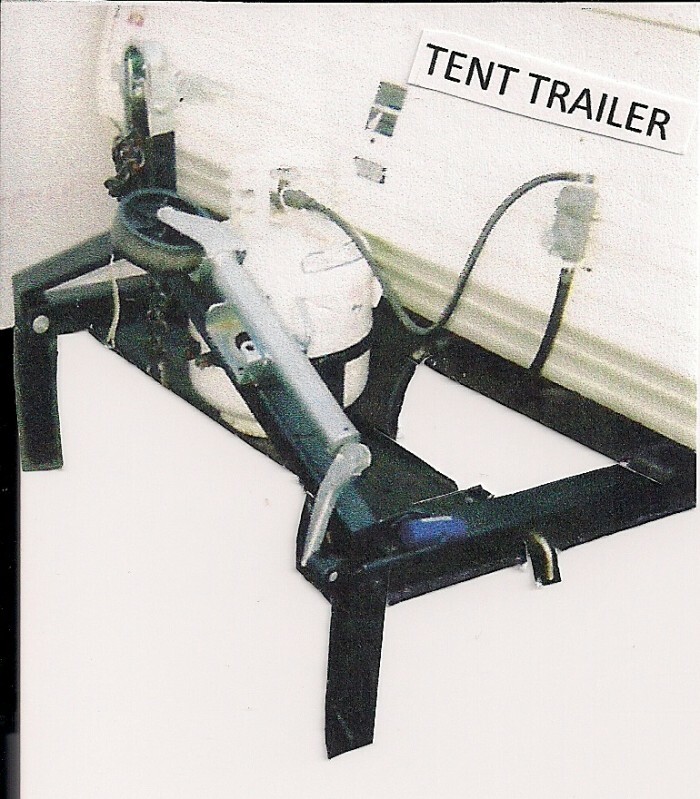 The trailer further consists of a tongue coupler hitch ( 20 ), a trailer bed and support wheels ( 36 ) and also contains side rails for the frame ( 2 ) and equipment cover ( 32 ). I desire an outright sale of issued & valid U. S. Patent No.7458597 (B2) and also it's issued & valid Canadian counterpart No. 2460262. Please mark all bids: "FOR U. S. ONLY" or "CANADIAN ONLY" or "FOR BOTH PATENTS"
While some mailings and email have gone out to a several Companies in the field. no sale or commitment to sell either patent, has been made. The market potential market for these products is tremendous, for the right Company. There are only normal conditions for a sale. Photos and a DVD/disk are available for interested parties. No Trademark or website is involved. 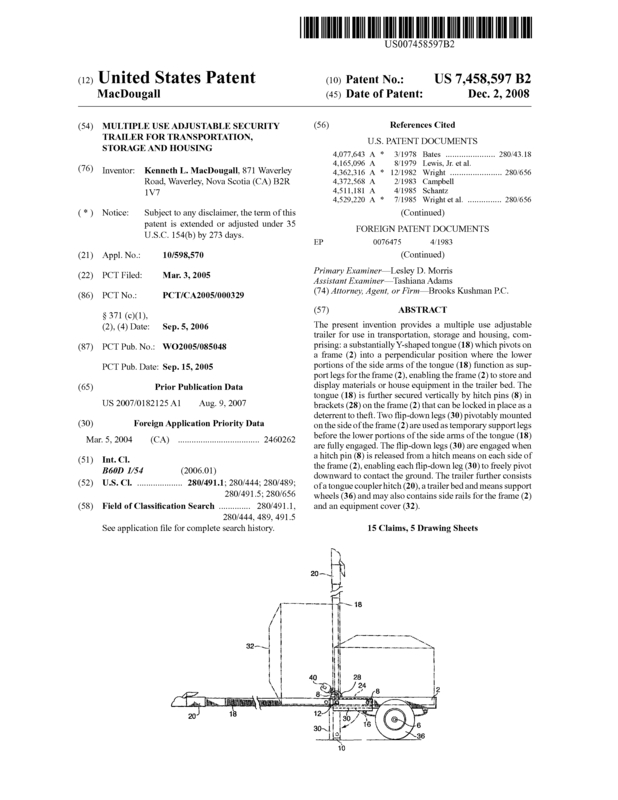 Page created at 2019-04-23 6:51:15, Patent Auction Time.